The Appalachian Trail or in short AT runs along the US East Coast from north of Atlanta to the middle of Maine and is app. 2.180 miles / 3.500 km long. Due to relocations the exact length varies from year to year. The AT is one of the three trails comprising the so called "Triple Crown" (Appalachian Trail, Pacific Crest Trail, Continental Divide Trail). I have hiked all three trails. 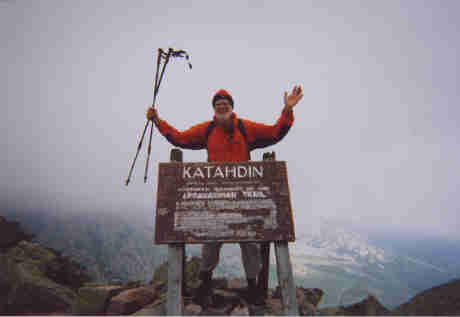 Every hiker is given a trail name. The name will be given by other hikers and is based on ones peculiarities. They thought of my hometown and that I am not the greatest fan of the food "Hamburger". Hence I was named HAMBURGER. The trail is a part of the American National Park system and is maintained by volunteers of local hiking clubs and a central organisation, the Appalachian Trail Conservancy. Plenty of information and help is available on the highly recommendable website of White Blaze that is named after the trail marking, a white blaze. Over the years this website has become better and better. I used the official trail maps as issued by the Appalachian Trail Conservancy. I would not do this again. Not because they are not good and informative enough but because of weight. It is not easy to get lost on the trail. Additionally I carried the trail guide "The Thru-Hiker's Handbook" from Dan "Wingfoot" Bruce. This or one of the other two guides that are annually updated would be sufficient. How come someone from Germany does have his annual hiking vacation in the US? Good Question. During a longer work assignment in Atlanta I had seen soon "everything" in town and its vicinity I considered interesting. And it was warm if not to say hot. It was then that colleagues recommend to go to the northern Georgia mountains, the Appalachians. No sooner said than done. This is how I came to hike the Approach Trail to reach the southern terminus of the AT, Springer Mountain. Once there I hiked maybe 10 yards along the marked trail. Now I could say that I have hiked on the (not the) Appalachian Trail. At that moment I thought that's it. But there were more weekends to be spent. So I made more and more miles in Georgia. And every mile twice as I had to return to my parked car. Next time in Atlanta I brought my old backpack, sleeping bag and sleeping pad along. I had planned to spend a weekend on the AT with staying overnight at one the shelters. In hindsight it was the completely wrong equipment, far too heavy and by no means complete for the back country. My equipment became better and better. Some stuff would be replaced by lighter and better fitting year by year. I very much liked that weekend. So following a stay in Atlanta I took a one week vacation and hiked the section from Dicks Creek Gap in Georgia to Wesser in North Carolina. I liked the week so much that I decided to do it again but this time for two weeks. And that should have been it. However it seems to be contagious. As can be seen I finally finished the complete 3.500 km and long stretches in Georgia and New Hampshire / Maine twice.